I just picked up the energy gels and am ready to start trying them out. Here they are in the photo below. I ordered 24 Gu Lemon Sublime flavour, 24 Gu Mandarin Orange flavour and 24 Gu Roctane Blueberry and Pomegranate flavour. The Gu Lemon Sublime flavour is without caffeine but the other two are with caffeine. I am going to take 24 gels with me, 12 of the Gu Roctane and 12 of the other Gu flavours mixed (provided I like the taste of both in my tests). It says on the packaging that the packs weigh 32g each, and provide 100 calories. Since I will be taking 24 of them that will be 2,400 calories and 768g. Now you may ask how I arrived at the figure of 24. Well there are 6 racing days in the MDS, and each racing day covers on average just under a marathon. My plan is to take one Gu Roctane just before starting each stage and then take 3 more gels (2 Gu and 1 Gu Roctane) spread throughout the stage i.e. approximately every 10km. If my pack feels too heavy with all the gels in it, I may take out one or two of the freeze dried meals. If on the other hand I think it is okay I will leave everything in as I am sure some extra calories will come in handy. I have to count up the calories again, but I believe I have somewhere around 18,000 calories in my pack including the gels and Peronin. I will not be taking any sports drink powders with me, and the gels will take their place. They contain similar ingredients and it is a lot easier to eat one sachet of energy gel then dispose of it rather than to fiddle around getting out powder, mixing it in the water and then putting it back in my pack etc. I can keep the gels handily in the waist pocket of my rucksack and avoid needing to delve into my pack at all at the checkpoints. 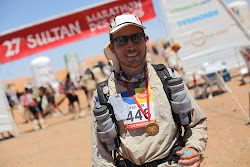 The strategy of replacing sports drink powder by energy gels is based on a blog I was reading that was written by a previous MDS competitor and an experienced ultra-marathon runner. If it is good for him then it is good for me. The only things I can think of that I am missing now are some extra plasters, a lip balm with sun protection and a mini toothbrush and toothpaste. Almost ready to go folks.